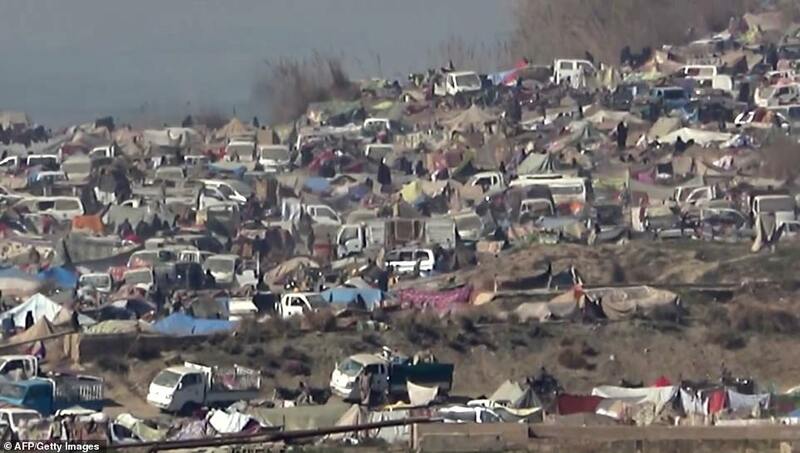 ISIS fighters hunkered down in a riverside camp surrounded by battered vehicles and makeshift tents in eastern Syria today as US-backed forces pushed to expel the militants from the last scrap of their dying ‘caliphate’. 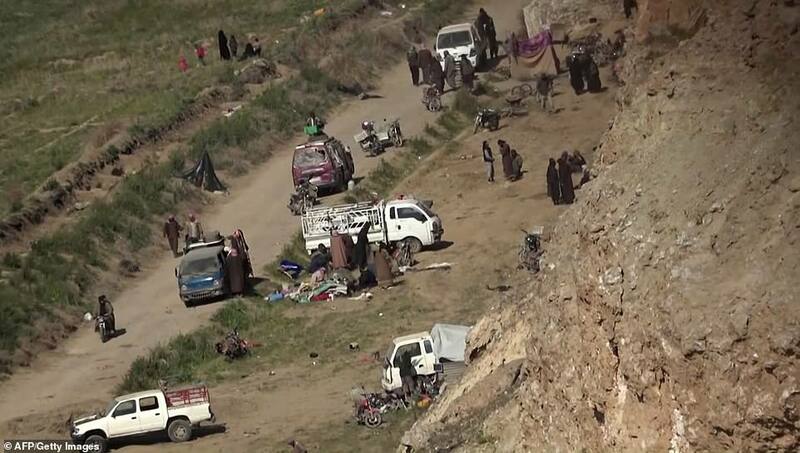 The last IS fighters and their families were cornered on Friday among a dense gathering of vehicles and tents on the water’s edge, caught between advancing US-backed forces and Syrian regime fighters across the river. 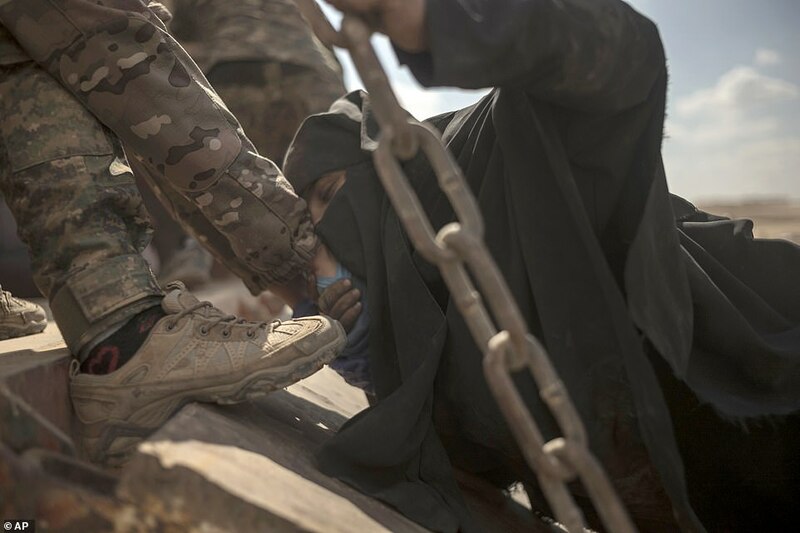 Men and women draped in black walked between a sea of small pickup trucks and caravans scattered across the uneven riverbank as the fighters were pushed out of their final stronghold, footage obtained by AFP showed. But General Joseph Votel, head of the US Central Command, warned today that many of those being evacuated from the area are ‘unrepentant, unbroken and radicalised’. He told Congress the fight against ISIS was ‘far from over’, and stressed the need to ‘maintain a vigilant offensive against this now widely dispersed and disaggregated organisation’. General Joseph Votel, who oversees US operations in the Middle East, said ISIS fighters had already dispersed across Iraq and Syria and remained radicalised. He told the House Armed Services congressional committee: ‘Reduction of the physical caliphate is a monumental military accomplishment but the fight against Isis and violent extremism is far from over. 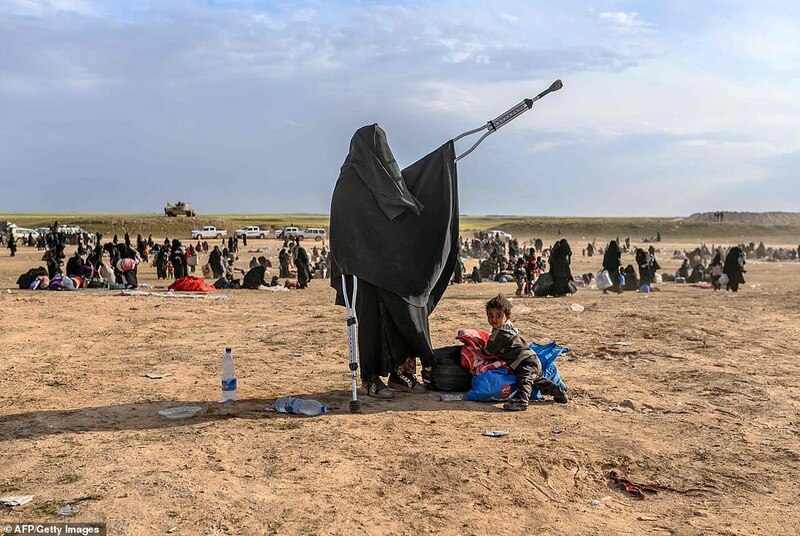 ‘What we are seeing now is not the surrender of ISIS as an organisation but a calculated decision to preserve the safety of their families and the preservation of their capabilities by taking their chances in camps for internally displaced persons and going to ground in remote areas and waiting for the right time to resurge. He added: ‘We will need to maintain a vigilant offensive against this now widely dispersed and disaggregated organisation that includes leaders, fighters, facilitators, resources and toxic ideology. 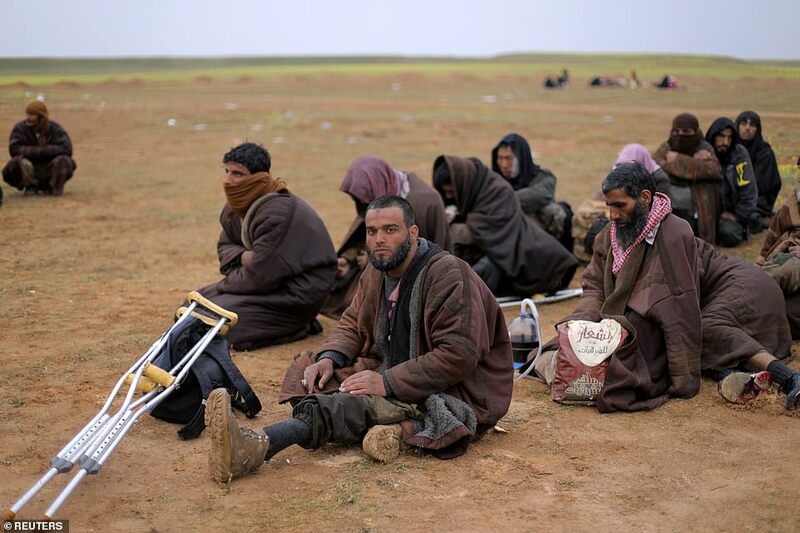 Defeated but unrepentant, some jihadists were seen limping out of their besieged final bastion in eastern Syria still praising ISIS and promising bloody vengeance against its enemies, reporters on the ground said. 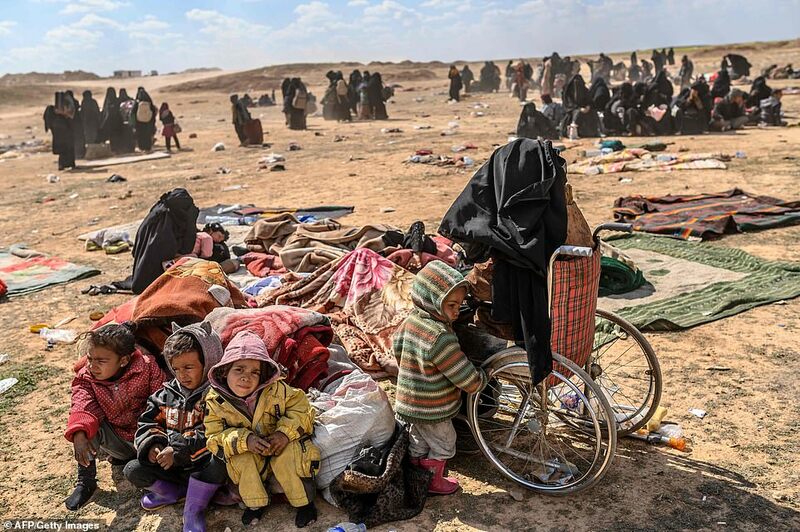 The skeletal and dishevelled figures shuffling out of the smouldering ashes of the ‘caliphate’ may look like a procession of zombies, but their devotion seems intact. 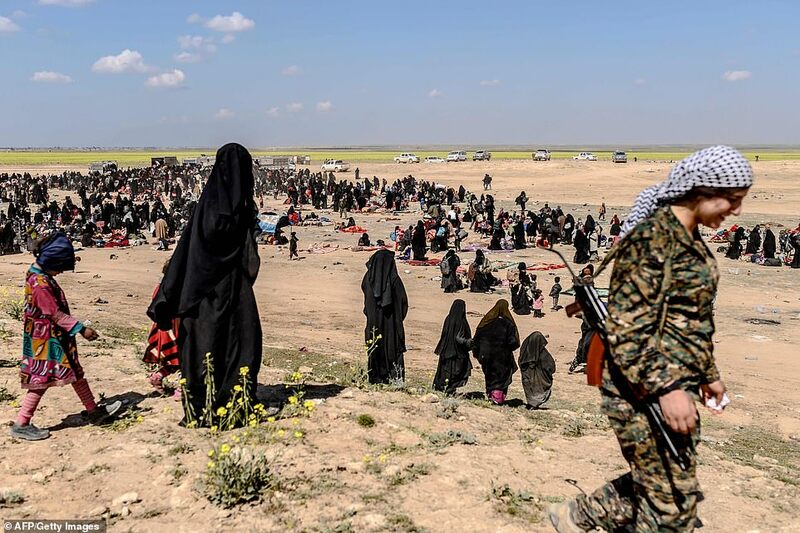 At an outpost for US-backed forces outside the besieged village of Baghouz, ten women stood in front of journalists, pointing their index fingers to the sky in a gesture used by ISIS supporters to proclaim the oneness of God. As the so-called caliphate crumbles, many Western countries have struggled to decide what to do with its citizens returning from the fighting. In Britain, the authorities have been dragged into legal wrangling and soul-searching over the fate of jihadi bride, Shamima Begum, and her newborn son. Despite begging to be allowed to return to Britain after fleeing to Syria from Bethnal Green, east London, aged 15 in 2015, she was stripped of her citizenship last month by Home Secretary Sajid Javid. Donald Trump waded into the debate when he urged European countries to take back their suspected fighters and try them in their own countries, threatening via Twitter that US-backed forces in Syria would release the militants into Europe. 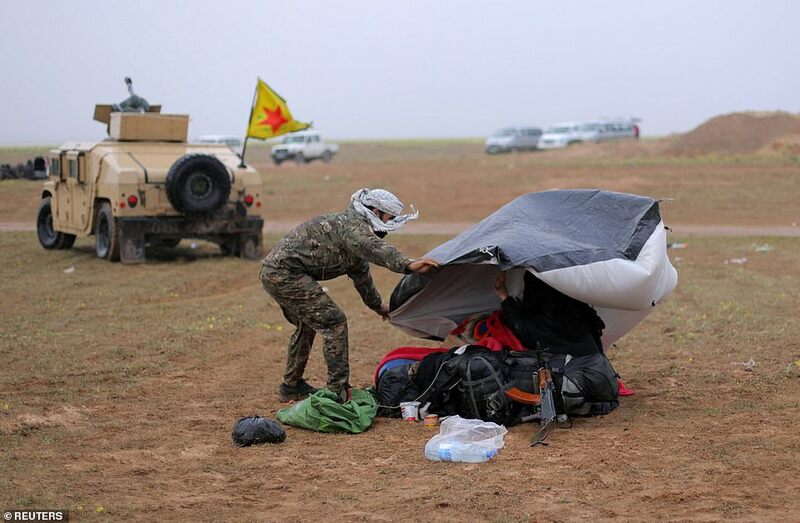 The Kurds also want foreign nations to repatriate their citizens and jail them in their lands, but are willing to make compromises if the international community will provide the funding and security for new prisons. Last month Iraq announced a group of 13 French citizens accused of fighting for ISIS are to be tried in the country rather than face charges in their home country. And the Kurdish government in Syria said if Britain and other European countries will not take back their jihadi citizens, then international tribunals, similar to the Nuremberg trials used to convict Nazi’s after the Second World War, could be set up to deal with the problem. 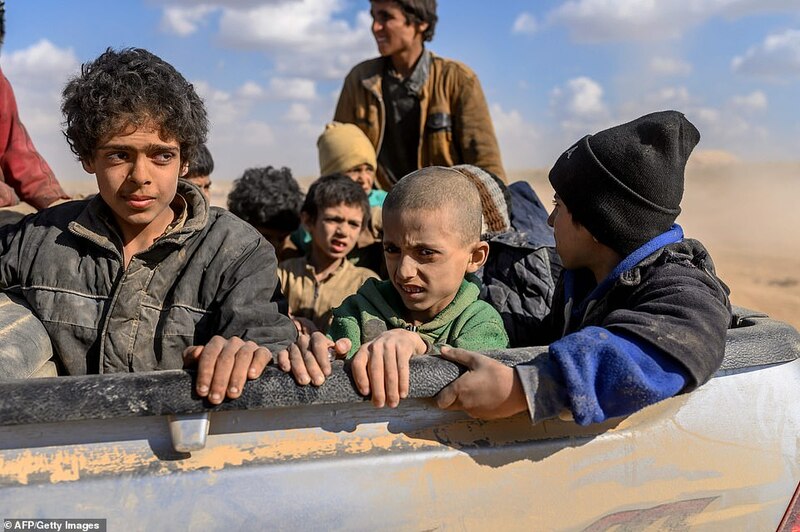 Syrian Democratic Forces (SDF) leaders said on Thursday they were hoping to finish the evacuation of civilians from the final ISIS stronghold of Baghouz to allow a final assault on the hundreds of hardened fighters thought to have dug in for a final stand. 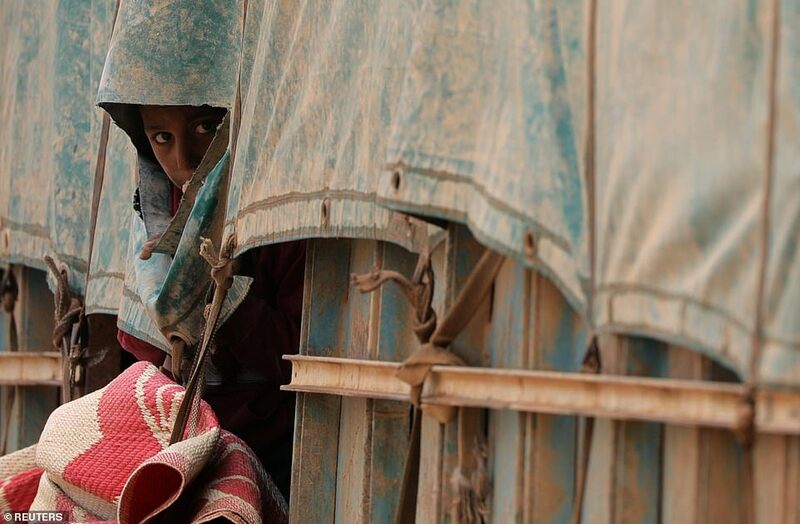 The images of the cornered jihadists and their families, filmed by the Free Burma Rangers aid group this week, showed a motorbike darting between a dark earth berm topped with clumps of reeds and a line of makeshift shelters. He was the latest wounded man to emerge from the dregs of the ‘caliphate’, after a stream of men limping out on crutches a day earlier. 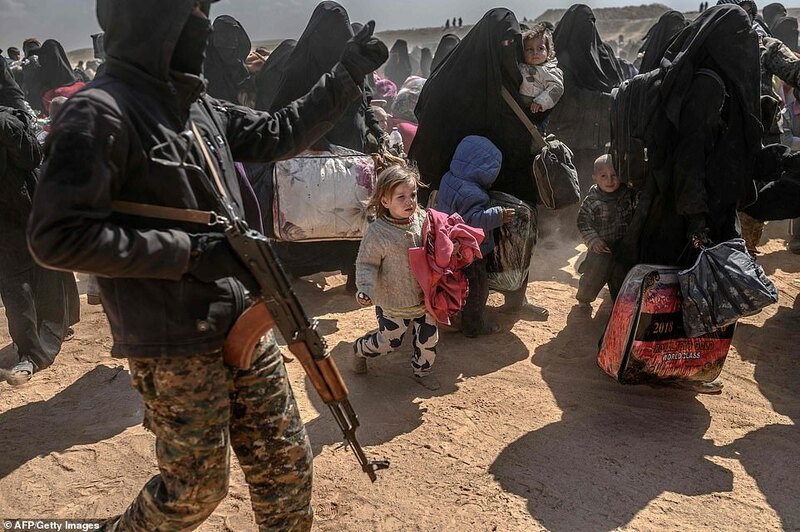 Around a tenth of the nearly 58,000 people who have fled the last ISIS bastion since December were jihadists, according to the Syrian Observatory for Human Rights, a Britain-based war monitor. 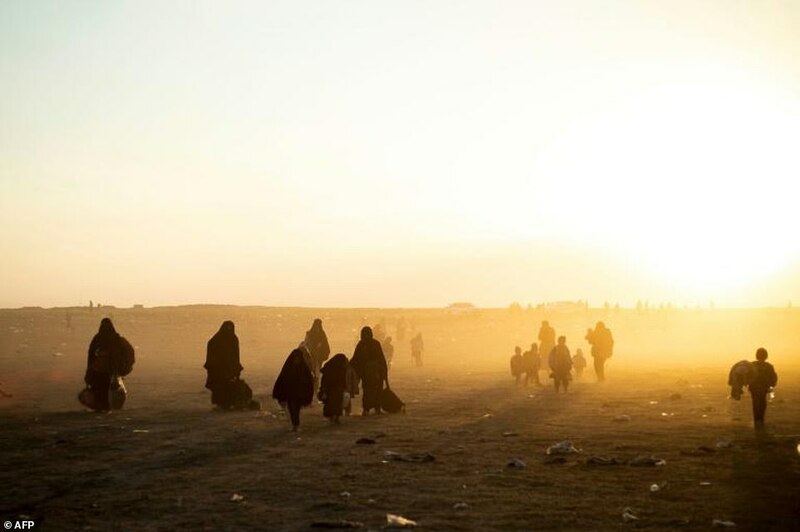 Baghouz is currently the only active front in Syria’s eight-year civil war, the latest battle in a complex, devastating conflict that has killed more than 360,000 people and displaced millions from their homes. 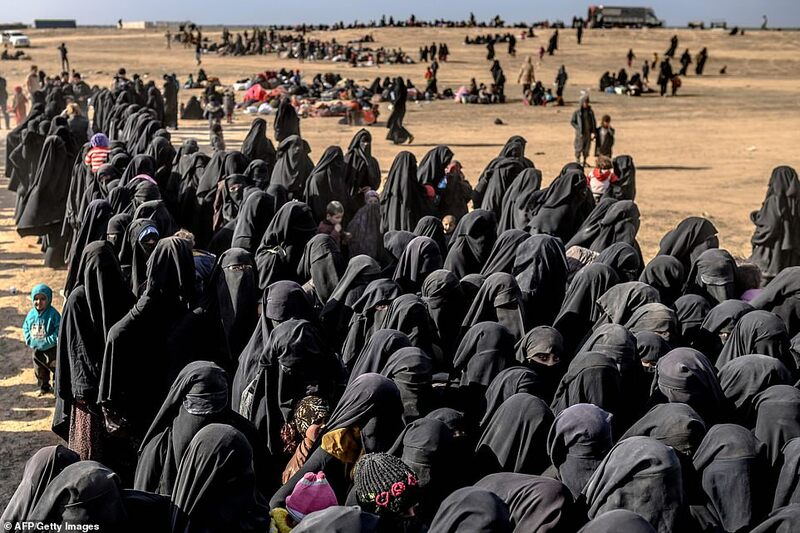 Indistinguishable under their identical black robes, a group of women arriving at the screening point manned by the Syrian Democratic Forces swarmed around reporters like hornets. Some threw rocks at the cameras of those trying to film them, while one screamed at a photographer and called him a pig. A third woman snarled at the way the reporter is dressed: ‘God curses women who resemble men’. 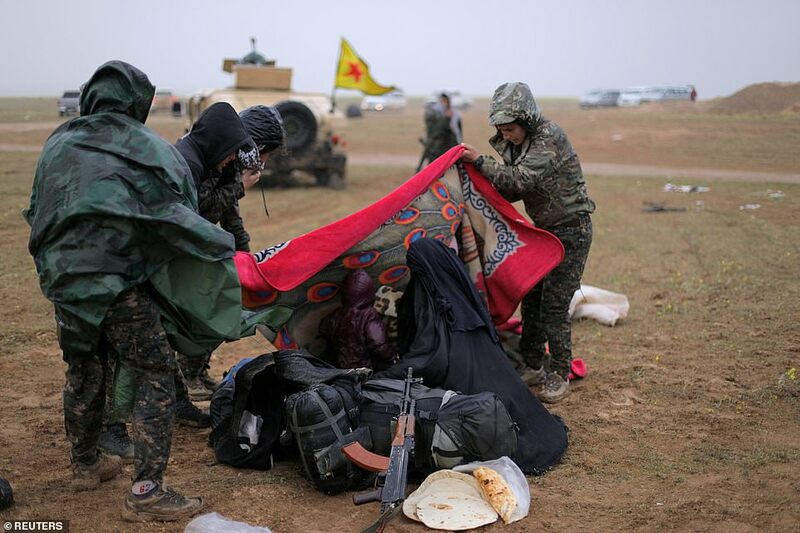 The SDF are closing in on diehard jihadists and their relatives holed up in a makeshift encampment inside the village of Baghouz. 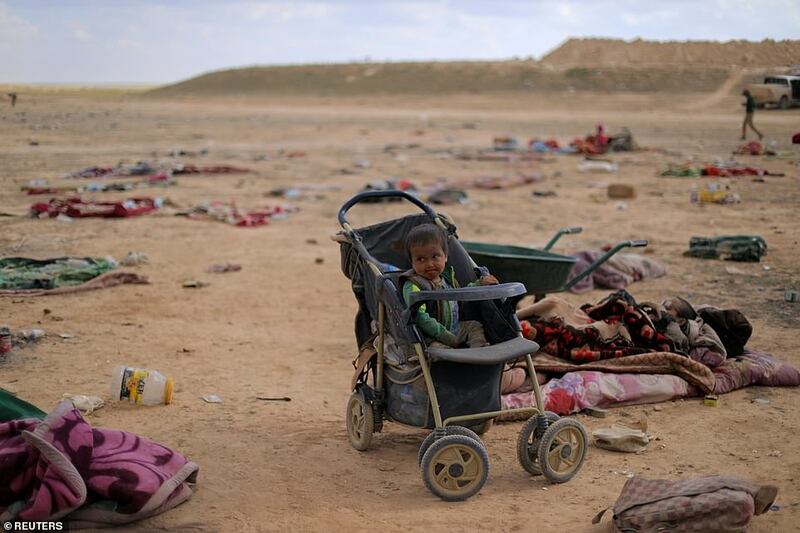 More than 7,000 people have fled the bombed-out bastion over the past three days, escaping shelling by the SDF and air strikes by the US-led coalition against IS. 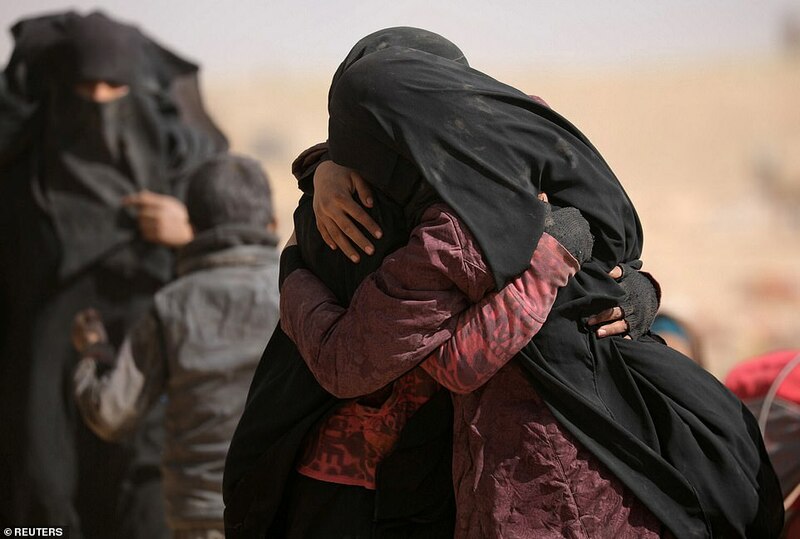 But for Umm Mohammed, a 47-year-old woman from Iraq’s Anbar province, the men who have fled are ‘the cowards and the meek’. As for the women, ‘we left because we are a heavy burden on the men’, she says. 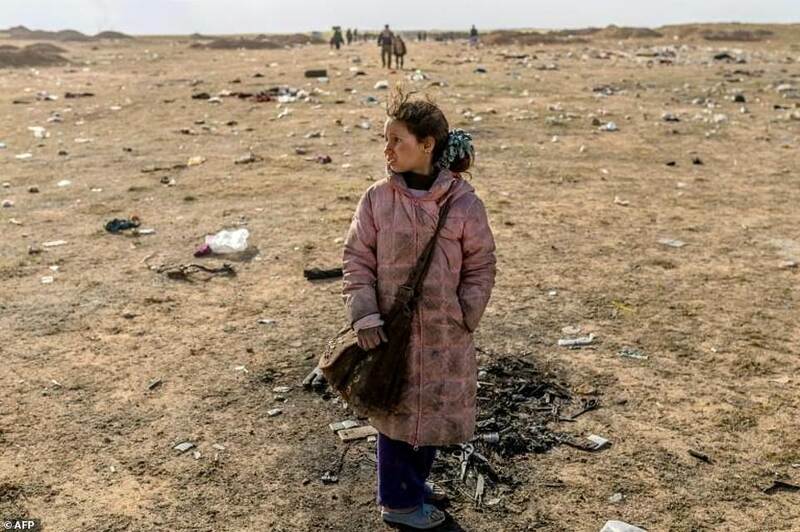 The so-called ‘cubs of the caliphate’ – boys raised under IS rule and trained to fight from a young age – are the reason the group will survive, another Iraqi woman says. 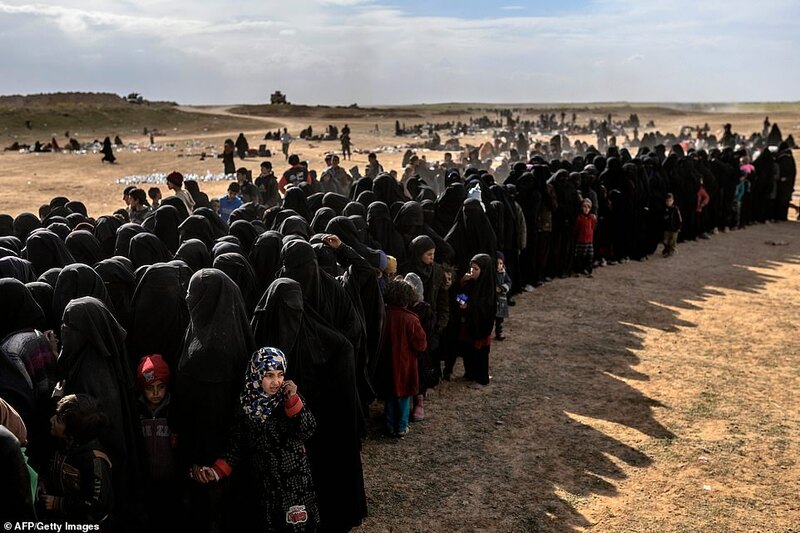 ‘The caliphate will not end, because it has been ingrained in the hearts and brains of the newborns and the little ones,’ says the 60-year-old, refusing to give her name. Many women told AFP that they want to raise their children on the ideology of the caliphate, even as its territorial presence fizzles out. ‘There was an implementation of God’s law, but there was injustice,’ he says, claiming he worked as an accountant for IS. The 30-year-old with white hair prays for the ‘caliphate’ and wishes IS ‘many conquests’ to come. 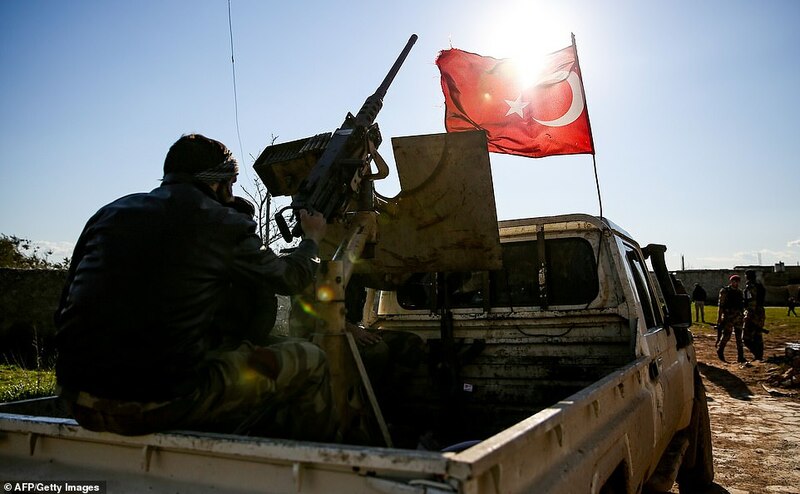 But he says many senior IS figures have fled to the northwestern province of Idlib or crossed into Turkey and Iraq. Najiyya’s harshest words are for the group’s elusive leader, Abu Bakr al-Baghdadi, whom he says he never saw once. ‘He left us in the hands of people who let us down and left,’ he says. ‘He bears responsibility, because, in our view, he is our guide’. When asked why it took him so long to quit the redoubt, Najiyya said he was afraid of being detained by the SDF because his cousins are IS fighters. He also says that rumours the jihadists would be granted safe passage to Idlib, largely controlled by a rival jihadist group, encouraged some to stay. 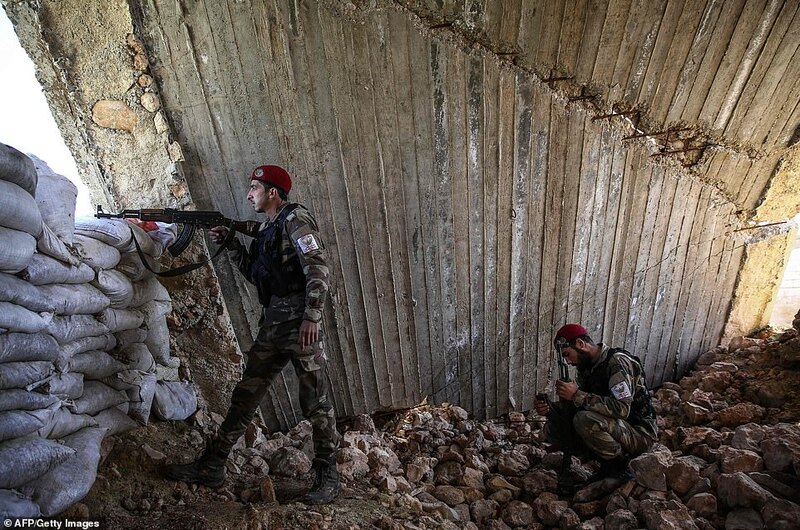 Nearby, a bearded man with a leg wound cursed the coalition, whose warplanes have pummelled the last jihadist redoubt. One woman, who says she is from Damascus, said: ‘We have left, but there will be new conquests in the future’. At the height of its rule, ISIS imposed its brutal interpretation of Islam across an area the size of the United Kingdom. 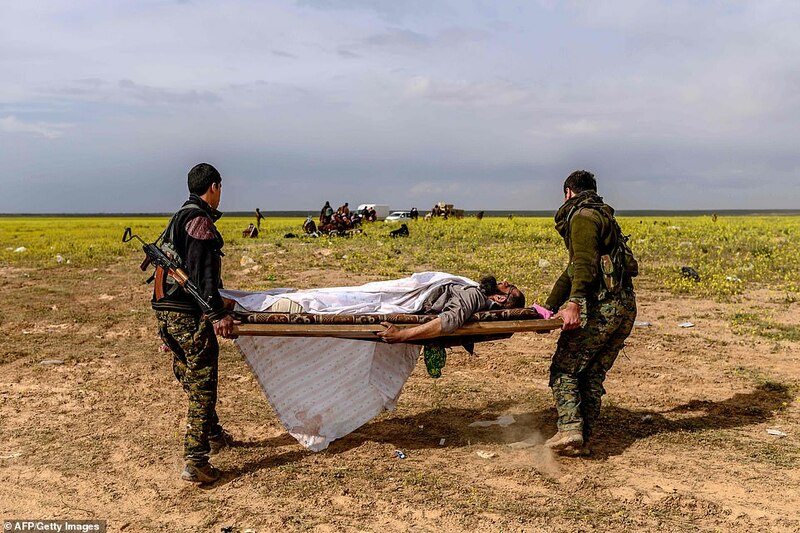 Beyond Baghouz, ISIS fighters are still present in Syria’s vast Badia desert and have claimed deadly attacks in SDF-held territory, including one that killed four Americans in the city of Manbij in January. The White House later said that around 200 American ‘peace-keeping’ soldiers would remain in northern Syria. 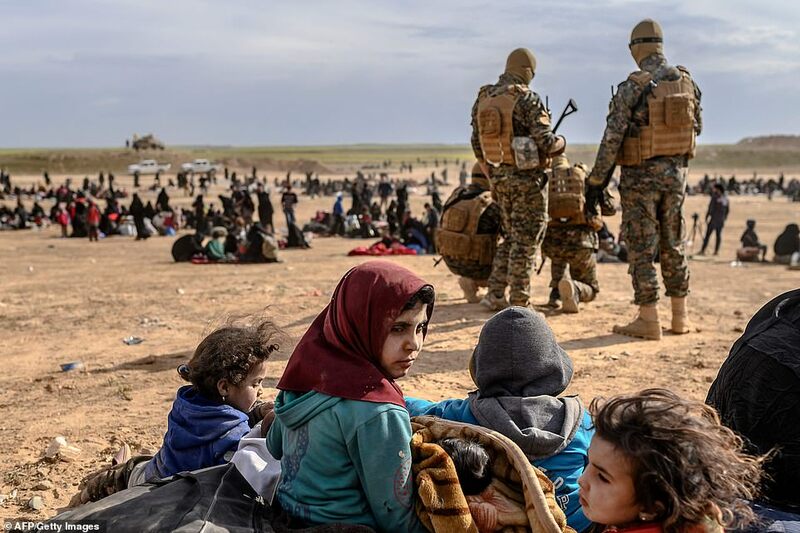 Syria’s Kurds have detained hundreds of foreigners accused of fighting for IS, as well as family members, but their home nations have been reluctant to take them back. 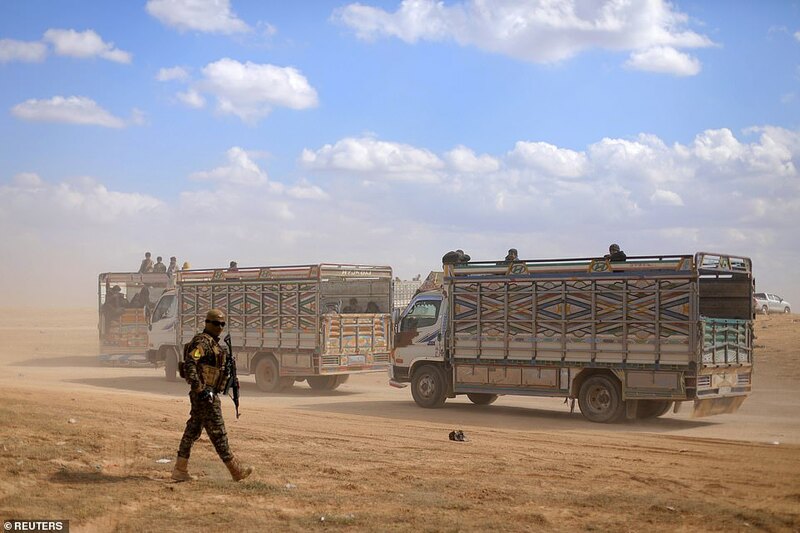 The SDF will resume their assault on ISIS’s last enclave in eastern Syria if no more civilians or fighters emerge by Saturday afternoon, a spokesman for the group said today. 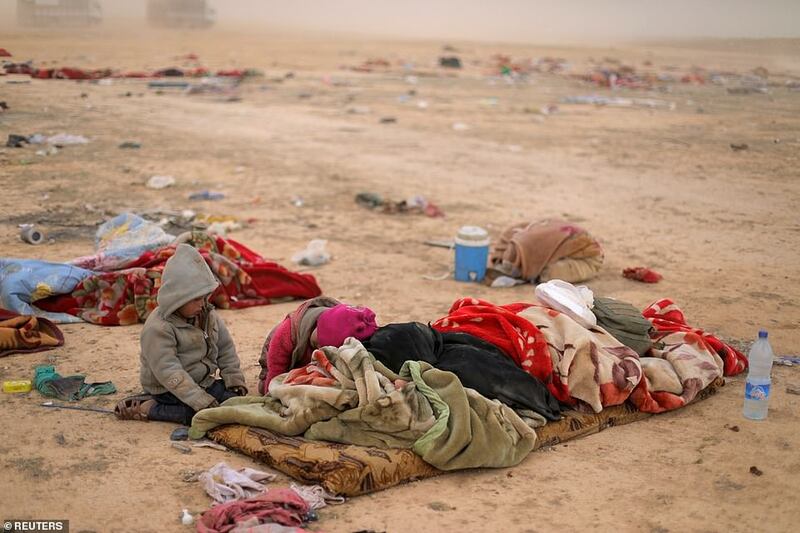 Mustafa Bali said nobody had come out of Baghouz since Thursday. The SDF announced it was launching a final battle for the enclave last month but has slowed its attack to allow civilians to leave. 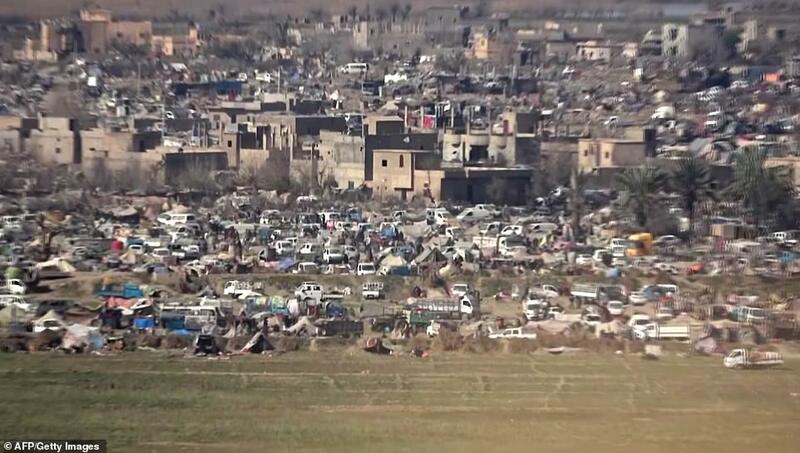 Thousands of civilians and fighters had emerged earlier this week.